My books are available in paperback and as eBooks on Amazon. The eBooks are for Kindle reader and all Kindle electronic book format readers such as Kindle for PC, for Mac, for iPad, for Android etc.Look for the books under my name. Both may be purchased online at Amazon in countries all around the world. 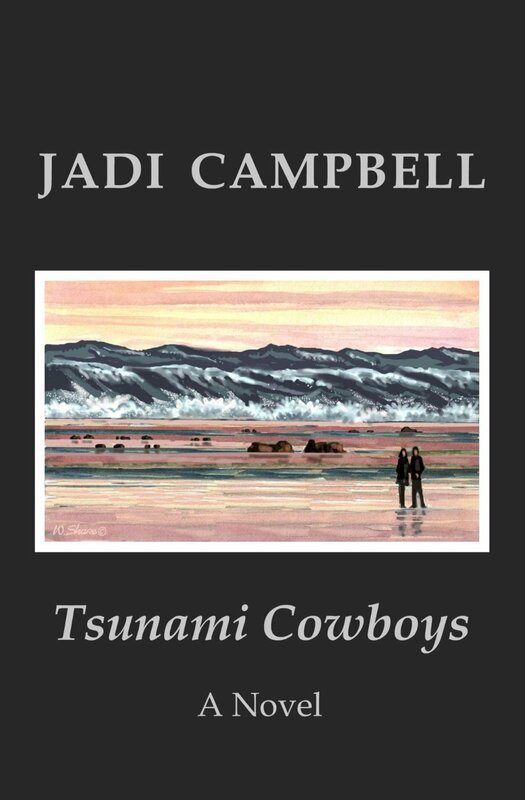 Tsunami Cowboys by Jadi Campbell. This link will get you there. For Germany, click here. Excerpts from Tsunami Cowboys may be read on these posts. Great read By Levy R on August 13, 2015: Like that Jadi carried over a character from her first book. Keep on writing! By Amy Patton on July 15, 2015: Jadi’s second novel was such a treat. I so enjoyed the interconnection of characters and how they seamlessly connected throughout the novel. It is such a great testament to Jadi’s travels and studies that she can write a book that combines culture and interest among the characters. I got to the end of the book and literally couldn’t put it down as she brought together the many characters to wrap up and piece together the relationships and unanswered questions at one final get together. Not to mention a surprising finish regarding Todd! Well done. I look forward to another novel and hope one is in the works. By MB on July 11, 2015: I loved this second release from Jadi Campbell. It is structured similarly to her first book, Broken In, in that it is a collection of short stories inter-connected through the characters. I really enjoyed her first book, Broken In, and felt even more drawn to the stories in Tsunami Cowboys. She covers a lot of emotional territory in these stories, taking the reader on quite the journey. Her writing is tight and compelling, making it well worth the ride. By Terre Poppe on February 23, 2015: Tsunami cowboys are people riding life’s waves. This novel tells the stories of several such cowboys.Lynn is the connection among the various people who populate this novel….All in all, this novel is even better than her first (“Broken In: a Novel in Stories”). The characters have even more depth; the descriptions are fuller; the feelings evoked in me are more powerful.I do have one question, though: What is Nadia’s real name? By june p on February 7, 2015: Jadi Campbell’s latest novel, Tsunami Cowboys contains a quirky cast of characters set in intriguing circumstances. Jadi thinks outside the box. She pulls on her experience as a world traveler, her knowledge of mythology and history, and her awareness of human psychology. She does not shy away from the messier sides of life. At times disturbing. At times uplifting. As with her first book, its always thought provoking. She pulls you in, keeps you on your toes and leaves you wanting more. In JJ’s, the bartender and a teenaged patron plan exotic trips. JJ’s chef meets several men who’d kill for her. Valuables and peace of mind literally get stolen. Couples celebrate, or split up. In a rainy night accidents happen and people vanish.These are the stories of people whose paths cross – or crash. The tales begin in a bistro and move on to Bangkok, a carnival midway, and the bottom of a lake, among other places. Broken In: whether totally random or according to plan, after tonight life will never be the same. Excerpts from Broken In may be read on these posts. Great read By Levy R on August 13, 2015: Excellent first book. Full of surprises and I like the way all the stories connected. Looking forward to more writings by this author! Finally, a book that draws you in and takes you on a fascinating journey! By C. P. on October 30, 2014: This book beautifully weaves touching and intriguing stories into a work of art that perfectly touches on the interconnectedness and unpredictability of the human experience. A fascinating read! By Diana B on January 31, 2014: As a people watcher, I have often wondered about those I observe in airports, train stations, restaurants, etc. What brought them to this place at this time? Where will they go from here? In this delightful gem, Jadi explores the stories of a variety of people who have passed through the doors of JJ’s restaurant. Each chapter brings a new story, although some of the characters we meet early on will return in later chapters, artfully woven together to create this novel. The characters are well developed, giving us the feeling of being in the story, walking with them through the events of their lives. The settings are varied, yet described in such detail that we can visualize the scene as a stage before us. Jadi’s writing style flows smoothly along, drawing us in more as each story unfolds. There are unexpected twists and turns that give us opportunities for reflection on human behavior, and the ways our actions affect others. Spoiler alert: not all the stories have a happy ending, but that is true in life, as much as we would wish otherwise. I thoroughly enjoyed reading Jadi’s first book and look forward to her next one! Compelling and Beautifully Written! By Robin O. Watson on January 24, 2014: Jadi’s first novel is compelling and beautifully written! She uses a clever technique of weaving characters throughout the book, although each chapter is a story in itself. Jadi has an extraordinary vocabulary. Each sentence is beautifully descriptive and the word just flow naturally. I could just imagine being an observer at JJ’s and listening in on conversations. Each character is unique. Broken In was a joy to read and I can’t wait to read Jadi’s next novel! Love this novel in stories! By Terre Poppe on June 22, 2013: JJ’s Bistro, in a town in the Pacific Northwest, is the touch point for the 10 stories that comprise this novel. Each story focuses on at least one person who has been in or works in JJ’s. …Jadi Campbell writes with depth and sensitivity about a variety of people and different situations. She did quite well bringing all these different stories to life. I felt like I was there with them as I was reading. It is clear that Jadi studies people and cultures. Her descriptions are delightful and/or sobering, but always feel right. As someone who loves to travel myself, my favourite story is “Waiting”, about Gabe and his world travels. I especially love what Gabe’s grandfather told him as Gabe was heading out into the world as a young man: “It doesn’t matter about the firmness of your handshake, and there will be people who care about that part of you the most. True strength comes in holding onto soft eyes, because it’s too easy to go the opposite route. Life is hard and bitter and it will break you without you realizing it if you decide to be angry. Have soft eyes, child.” Take your soft eyes and read this first novel. It is excellent! I look forward to more from Jadi Campbell. A wonderful and enjoyable “novel in stories’! By Amy B Patton on May 15, 2013: This was my first “novel in stories” and I must say I loved the premise. Jadi, in writing this book, really did a great job of keeping the interest alive from chapter to chapter. I was impressed by her ability to use the English language in a way that added an element of excitement to the characters. The linking of characters and plotlines as the story went along was particularly good. I think Jadi is a talented writer and I look forward to more works from her. Bonjour! I am an ex-pat living in the south of France. Thanks for stopping by one of my blogs and I am glad you found something you enjoyed. Thanks, Geraldine – go to the Amazon.com page to see the reviews for this book. Readers have liked it! A precise data to read you live and live. I’m going to turn to my son for Spanish translation if he does not have it. Now you leave me anxious to dive into your books and if it is as you describe it, surely they will be good. I feel privileged to have you on my blog because you are a fabulous writer. What a beautiful message! Come see me on my current site jadicampbell.com and I would be thrilled to have you read my novels. ¡Que seas feliz!